Multi gyms are fantastic pieces of kit for getting in shape, toning up a range of muscles and building up bulk at home. For anyone looking to exercise and strength train at home, a multi gym offers a great way to do so. Get those arms working hard, hit your core and target your legs on these all-encompassing weight machines that help you get a near full-body workout. Their design means you can perform a number of top exercises all on the same single fitness machine from the comfort of your own home, and thanks to the weight stack and selector pin, finding the right weight for each set of reps couldn’t be easier. 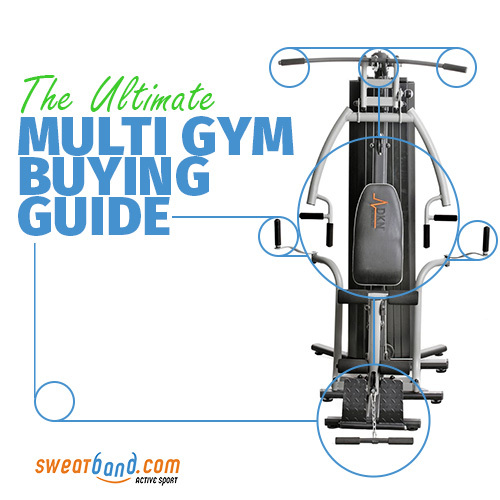 So if you’re interested in purchasing a home multi gym, take a look at this buying guide that will run through all the important things to keep in mind before you buy. There’s quite a price range when it comes to multigyms, with the simplest ones starting at around £200 and going all the way up to £1000-1500. Commercial machines continue well above £2000. You need, therefore, to consider how much you want to invest in your own multi gym, and to think about your aims, how much you will use the machine, how heavy a weight stack you’ll need and what range of exercises you want to perform. Generally, the stronger the machine, the more adjustable the seat or backrest, the heavier the weight stack and the higher the number of workout stations, the more the multi gym will cost. As stated, in general as price increases so does the weight of the stack on the multi gym. More basic machines may have a weight stack of around 30-35kg (66-77lbs) with top-end home multi gyms anywhere around 70-90kg (150-200lbs). Whilst having more weight is a good thing for users who plan to use the machine to get stronger and stronger and don’t want to outgrow the weight stack, for many potential purchasers having a really high amount of weight isn’t necessary. Remember that effective loads can be significantly higher on exercises, so selecting 75kg weight for a specific drill might actually be the equivalent of working out with up to 150kg. Despite the variety in multi gym designs, prices and looks, there are a number of workout stations that are pretty standard on all machines. So let’s take an in-depth look at what they are and what they do. At the very top of a multi gym you’ll see a long bar connected to the pulley system. This is the lat pull down bar and it focusses on your back muscles and in particular the latisimus dorsi (or lats) which is roughly just below your shoulder blades and extends down your back. Sit down as for the pec deck, grip the bar and pull it vertically downwards in front of you. You’ll also be engaging arm and shoulder muscles to perform reps of this exercise, and can get different attachments to vary use of this station and target different muscles. The bench press is a very popular exercise and can be done either by lying flat on your back and pushing the handles vertically upwards or by reclining at an incline and working arms diagonally away from your body, depending on the design of the machine. Again, this will get your chest, shoulders and arms working the hardest. The peck deck targets your pecs, or your chest muscles, and works by you holding the levers and pushing the arms on the machine away from you and into the centre, then gradually returning to the start position. As well as your pectorals, this seated exercise will strengthen a number of other muscle groups in the upper body. Most home multi gyms will have a leg developer which enables two classic exercises: the leg curl and the leg extension. These drills let you tone up your hamstrings and quads respectively and again are very popular. Simply sit on the seat, select the right position for your legs and your desired weight, and start working out! This strength and stamina improving exercise station, also called the low pulley row, works your back and upper body and is a top fitness-enhancing workout. Grip the row handles either sitting on the floor opposite the multi gym or on the seat, depending on the machine’s design, and pull into your torso like you would on a rowing machine. Whilst not all multi gyms will definitely have one, the preacher curl pad is a great addition which will work your biceps the hardest and very effectively. For this you’ll need some free weights – dumbbells, a barbell bar or an EZ curl bar. Sit on the seat and rest your arms on the pad in front of you. Then grip the weights and pull them towards you. Again depending on the design of the machine, you may be able to use the weighted rower low pulley in a similar position using the preacher curl pad. If you want to know more about the benefits of getting a multi gym, check out our 8 Top Reasons To Buy A Home Multi Gym article. And to start browsing for your new piece of weight training equipment, click the button below to head to our Multi Gyms Department. We’ve been selling sports and fitness equipment for years so you can buy confidently in the knowledge that we’re experts. We stock products from a range of top sports and fitness brands and only sell products that we think customers will love and get great use out of. We strive to offer the most competitive prices on the market. We’re a Google Certified shop, with Google confirming we provide first-rate customer service and reliable dispatches. They even protect all purchases up to £1000. We’re not just an online shop. Come visit our stores in central London and North Manchester and speak to an expert who can advise you on the right equipment for you. We also have a full team of customer service agents ready to help with any questions or issues you may have. We also have a warranty specialist who will, in the case of anything going wrong, ensure you’re not left on your own to deal with suppliers or manufacturers. Follow us on Facebook, Twitter, Google+ and other social media channels for more content, fantastic competitions and unmissable deals on sports and fitness equipment! Official Wimbledon 2016 Towels Now Available!